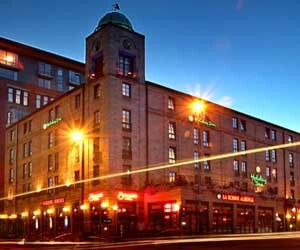 Located in Glasgow&regs fashionable Theatreland district, the award winning Holiday Inn Glasgow City Centre Theatreland offers 113 superbly appointed, air conditioned rooms as well as spacious Executive Rooms, sumptuous Penthouse Suites and Wi-Fi access throughout. To say we are a favourite among guests who choose hotels in Glasgow for short breaks, shopping trips, theatre breaks or business meetings is certainly true. However, we like to think winning Intercontinental Hotels Group&regs Torchbearer Award for three years running, proves our point and puts us ahead of other hotels in Glasgow . Thanks to the hotel&regs superb location in Glasgow&regs city centre, you are just steps away from the King&regs & Pavilion Theatres, the Royal Concert Hall, the best shopping outside London, as well as many restaurants and bars, including our own AA Rosette winning La Bonne Auberge Brasserie. Other attractions include the famous Kelvingrove Art Gallery, the works of Charles Rennie Mackintosh, the Glasgow Science Centre plus the SECC and Clyde Auditorium. The picturesque sights of Loch Lomond are within easy reach too.